UNMC › Eppley Institute › About Us › Faculty › Prakash Radhakrishnan, Ph.D.
Ph.D. - University of Madras, India. Pancreatic cancer (PC) is highly lethal disease. Elevated circulating levels of carbohydrate antigen 19-9 (CA19-9), CA125 (also known as MUC16) and other tumor-associated glycoproteins occur during PC progression, and correlate with poor prognosis, a higher incidence of metastasis, and reduced overall survival. Alterations in levels of these biomarkers are used clinically to monitor disease progression. Studies from our laboratory have demonstrated that expression of truncated O-glycans (Tn and sialyl-Tn, STn) in PC result in part from hypermethylation of the gene encoding the Core 1 synthase specific molecular chaperone (COSMC). Aberrant expression of Tn/STn antigens on mucins and other glycoproteins enhance the malignant properties of PC cells. We recently discovered that, in addition to serving as biomarkers, aberrantly glycosylated forms of the large mucin-type glycoproteins that contain the epitopes recognized in the CA19-9 and CA125 assays, also have biological activity as growth factors or cytokines. Research from our laboratory has shown that aberrant expression of truncated Tn/STn structures on the MUC16/CA125 expose EGF-like and other regions of the protein cores that bind to epidermal growth factor receptor family members (ErbB1-ErbB4), and integrin (α4β1) complexes, which in turn induce activation of oncogenic signaling cascades through Akt and FAK, and thereby increase the malignant potential of PC cells. 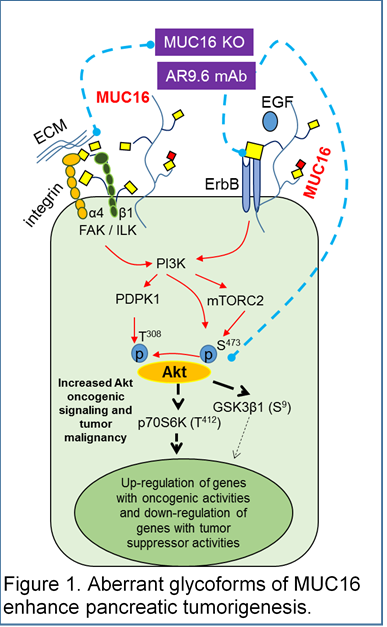 Importantly, treatment of cancer cells with monoclonal antibody (mAb) AR9.6 or B43.13 (that bind to MUC16 core protein) block these oncogenic signaling cascades (ErbB2, ErbB3, Akt and FAK) and inhibit in vivo tumor growth and metastasis. Moreover, genetic deletion of aberrant glycoforms of MUC16 reduce in vitro invasiveness and in vivo tumor growth and metastasis and increase median survival of the tumor bearing animals via reduced activation of ErbB2, ErbB3, Akt, GSK3β, and FAK (Fig. 1). Thus, in addition to serving as a biomarker for adenocarcinomas, aberrant glycoforms of MUC16 (Tn/STn-MUC16) have biological functions that may contribute to tumor progression, early metastasis and secondary effects of tumor growth. A major project in the laboratory is to investigate how truncated O-glycans enhance the malignant properties of PC using a novel COSMC knockout KPC mouse model system. Importantly, determine the molecular mechanisms by which altered glycosylation of mucin (MUC16) and other glycoproteins create biologically active compounds that contribute to tumor progression, early metastasis and systemic effects of cancer progression. Other important projects include investigating the site-specific mutation of MUC16 and other glycoproteins that mediate pancreatic cancer tumorigenesis, and development of new targeted therapeutics for pancreatic cancer.